Croizet XO Gold is made up of eaux-de-vie made from grapes that have been grown in the Grande Champagne region of Cognac in France, which is probably the most sought after Cognac “cru” because the chalky soil in Grande Champagne is known to help produce grapes that can be made into brandy with qualities for which Cognac is famous – finesse is among them. Once the grapes are made into wine and the wine is distilled into brandy, Croizet place the brandy in French oak barrels for a minimum of 10 years so that it can mellow and draw out flavours from the oak. Soft fig, dates, brandied cherries and almond sit beneath wood notes that waft up with spices – at first pine and cedar is most noticeable, and then varnished wood hits the nostrils as it tingles with a teasing sweetness and lashes of dryness that is almost Oloroso or Fino cask in character. As the brandy rests, mint notes develop with licorice – quite toothpasty, if that’s a word, but delightful all the same. The fruit then sweetens, and it morphs into raspberry confectionery as hints of cocoa, vanilla, ground coffee and cigarette tobacco liven up the bouquet. The spice is the star of the show, so subtle and yet so vivid with its fiery pepper undertones carrying cardamom, cloves and dried chilli. Something savory then flickers, similar to Worcestershire sauce but for the Mexican aficionados among you also resembling Chipotle sauce. Just when the aroma dims from an overtired nose, mushrooms sautéed in butter and some pepper leap out. On the palate the brandy is initially smooth with the crystalline sugary sweetness of marmalade, dried dates and glazed cherries, and then the oak hits at mid-palate with lots of spice. The ethanol progressively becomes more aggressive in-tandem with the increasingly prominent oak notes, with anise seed from the eaux-de-vie brightening up the palate with mint – this is a distiller’s dream, the alcohol itself is really interesting even without the oak influence. The finish is drying and bitter, with notes of vinegar and saffron intermingling with a mildly sweet pear salad with balsamic and salt. Buy it. 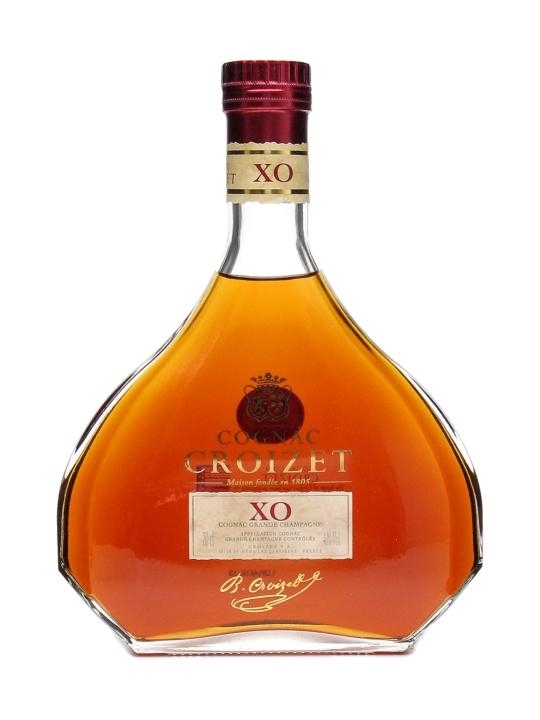 Croizet XO Gold is an interesting, complex and entertaining brandy that offers a variety of flavours that marry together nicely. The oak is big and bold, but the fruity heart of eaux-de-vie softens it at the right times to make for a cognac that is extremely drinkable. This is not a boring Cognac. Far from it. This is a Cognac that kept me sniffing and tasting with interest, and with each sniff and taste new aromas and flavours would emerge. It is a bit steeply priced for an XO Cognac, but its price is not overly excessive and I think it offers decent – though by no means excellent – value for what you are getting. A mild to medium cigar, such as a Macanudo or a Romeo y Julieta compliment the Cognac nicely. As for food, this struck me as a versatile Cognac that went well with a variety of foods. This entry was posted in Cognac and tagged Brandy, Cognac, Croizet, France, XO. Bookmark the permalink.